Not a project or video of mine, but I just love this example of an embedded object by RJ Make. He shows us how to extra Magnetron Tubes and then uses Simplify 3D to embed it in a print. RJ uses a different Simplify 3D technique than I do. I tend to rely on Multiple Processes with custom Starting and Ending Scripts. RJ takes advantage of another section of that Scripts tab. 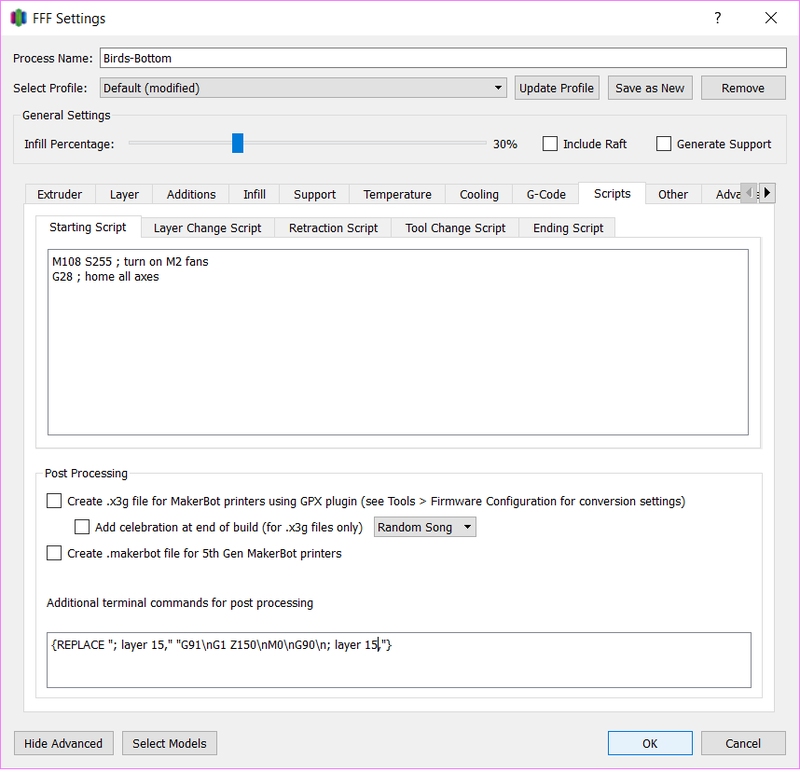 In the Additional terminal commands for post processing, you can set up special code that runs against the G-Code Simplify3D makes to print your object. If you pull up your G-Codeinto a text editor like Notepad, you can see that each layer is prefixed with a comment in the G-Code. In the screenshot below, the text “; layer 15,” indicates the very start of my Layer #15. This gives you a nice place mark and opportunity to do a search and replace . You use \n for your Carriage Returns. Other than that, everything is normal G-Code. G90 (putting the nozzle back into absolute mode so it has its bearings when RJ resumes the print). Simplify 3D compiled the G-Code and ran the Search and Replace, so the additional commands were at the very right spot, right before my Layer 15. One thing that intrigues me about this technique is what I call my “sealing” layers, the layers that will be sealing my object in. Often these are the very first layer of a brand new process, so they are picking up my First Layer Settings (which I do adjust accordingly). When you use this technique, the sealing layer would be picking up the bridging settings. I look forward to giving RJ’s technique a try!